Kyle Mohan’s adventures continue as he travels the country to compete in the Formula Drift pro series. 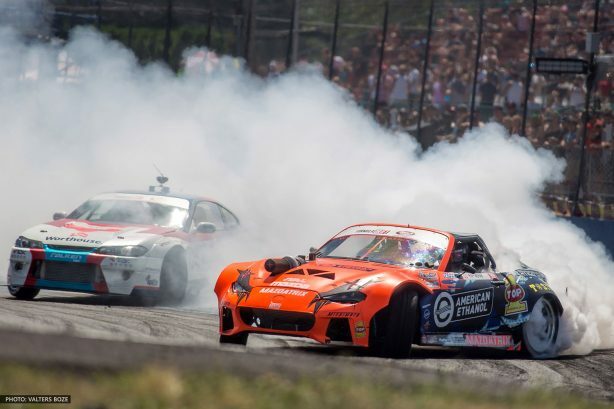 Mohan recently returned from the FD Seattle event at Evergreen Speedway, where the Mazdatrix MX-5 excited the northwest crowd with big tire smoke and screamin’ full-throttle 20b rotary engine. The KMR team worked hard to dial in the car’s setup to qualify for the Top 32 competition. Mohan drove well against series leader, James Dean, in tandem battle, but dinged a track cone giving the advantage to Dean. Next stop on the #KMRroadtrip is to Jefferson Speedway in WI for a drift demo presented by doc Drink, followed by Round 6 of the Formula Drift series in St. Louis, MO August 10-11.